Latest niche store to offer equipment for afterschool activities. 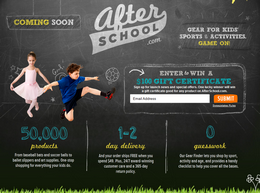 In June I scooped that Amazon.com subsidiary Quidsi was working on a new site call Afterschool.com. This is the second Quidsi site I’ve scooped thanks to domain registrations. Afterschool.com now resolves to a coming soon launch page, Quidsi started social media outreach yesterday, and it recently started sending notices to merchandising partners. So what will the store be about? Equipment for kids sports and activities. This is an interesting and clever market approach.